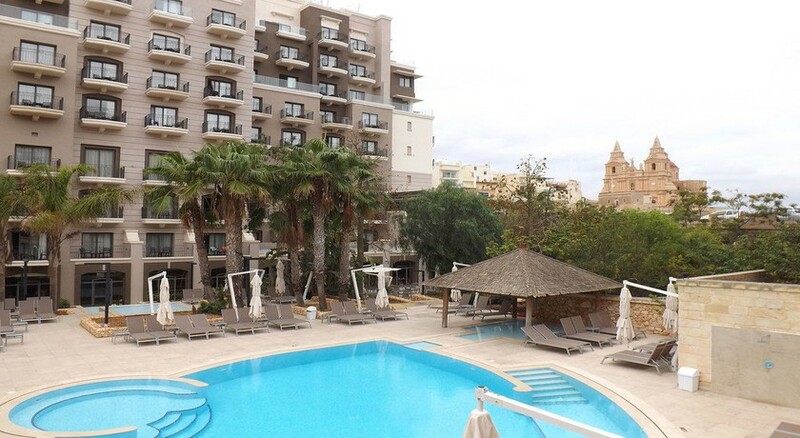 Maritim Antonine Hotel and Spa is nestled in Mellieha a picturesque village in Malta. The property is only 2.2km from the largest beach on the island. For travellers who want to discover Mellieha, the 4-star Maritim Antonine Hotel & Spa Malta is a great place to stay. The hotel is close to a number of attractions including the cathedral in Mellieha, Paradise Bay, Armier Bay, the Red Tower and Mellieha Bay. The hotel enjoys the advantage of being perched on a hilltop, allowing for all the 218 guestrooms to have an excellent views of the Mediterranean and the countryside. The hotel features two restaurants, two bars and two poolside bars! Maritim Antonine Hotel and Spa is located in Mellieha, a picturesque village in the north of Malta, close to the longest beach on the island, Ghadira. In the immediate vicinity there are bars, restaurants, shops and public transport. The Megalithic Temples are about 15km from the hotel. The island of Gozo is about 17.2km from the hotel. The Cirkewwa Passenger Terminal that ferries you to Gozo is only 6km from the property. The Malta International Airport is 22.6km away. 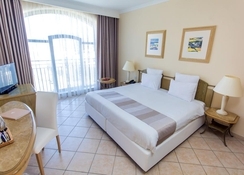 Most of the 218 guestrooms at the Maritim Antonine Hotel and Spa offer amazing views of the sea, the village and the hotel’s gardens. The spacious rooms are modern and decorated in bright and warm colours. They are equipped with a bathroom with a shower, a hairdryer, a direct dial telephone, satellite TV, free Wi-Fi, and a hire safe. In addition, they have a full minibar (with extra charge), tea & coffee making facilities and air conditioning and central heating. Breakfast options include either buffet breakfast or in-room breakfast. After a short walk you will reach numerous restaurants, such as the Il Mithna, which prepare delicious specialties. The hotel features Les Jardins Restaurant, Al Ponte Bistro and Pizzeria, Le Mirage Bar, 120 Bar as well as two poolside bars. Maritim Antonine Hotel and Spa has a rooftop pool with stunning views of the Mellieha Valley and the blue waters of the Mediterranean Sea, as well as a pool in the middle of the gardens with a solarium and terrace, plus a heated pool in the indoor area. The Spa by Transforma offers free use of the sauna, steam bath, relaxation area and gym. Guests can also opt for massage services and several spa options (with extra charge). Billiards is available at Bar 120 and a variety of entertainment programs (live) offered at Le Mirage. The Hotel has a new rooftop restaurant "Antonine Al Fresco" serving Thai food. Open for the summer months. We are pleased to confirm that the refurbishment was completed. A new heating / cooling system in our main restuarant and refurbishment of the Les Jardins restaurant. An upgraded indoor pool area with new showers, deckchairs and a complete refurbishment. A new elegant stair case from our conference room areas leading to the main restaurant. The hotel is now fully functional with all 218 rooms and services available. Excelent Hotel will be returning in the near future .All the facilities one could want.Plenty of quality food choices with differing theme nights in the hotel.Three different pools. The rooftop pool and cocktail bar our favourite. the hotel is near to other local restaurants and shops and is only a short bus ride from the sea.The hotel caters for all age groups in a carefully managed way.I would highly recommend it to anyone .Although not the cheapest it is well worth the money spent. Stayed for 3 nights in May 2018, checking in was really easy, friendly staff on reception, room was lovely and would definitely return. All staff were so friendly and the breakfast was fantastic. We stayed for Easter week with our 2 year old and had a great time, the rooms were clean and had everything we needed. The hotel staff were very friendly and accommodating. The pool was very cold but that was because it was still early in the season so we used the indoor pool. The hotel was in a good location for shops, restaurants and a short walk down to the beach. The bus stop was outside the hotel so you can travel all over the island. Would definitely look at staying there again. Great staff and lovely hotel. Would return if needed a quite break. Staff would help you with anything you asked. Cocktails are lush.